PNG is the most popular lossless image compression format on the web these days. The adjective “lossless” means that these files come in the best quality, but high quality is not always welcome by certain online resources. Resizing an image is a good way of making it more usable in the Internet and that gives users better sharing and storage experience. Icecream Image Resizer is a special tool for completing this type of tasks. It allows users to change the parameters of pretty much any images, including those that come in PNG format. 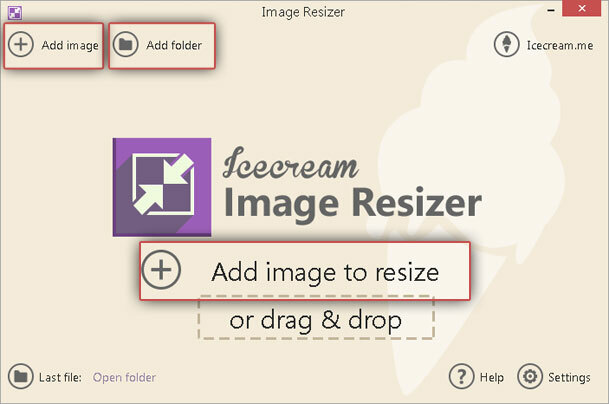 This tutorial will explain how to use Icecream Image Resizer to resize PNG images. Users can download Icecream Image Resizer on our website by clicking on the “Download” button. The process is standard and simple and doesn’t require any additional installation software, keys, passwords, registration or payments. Just run the setup file and proceed with the installation as recommended by the Wizard. Once that’s done, just launch the program and resize the images according to the guidelines below. Add image. 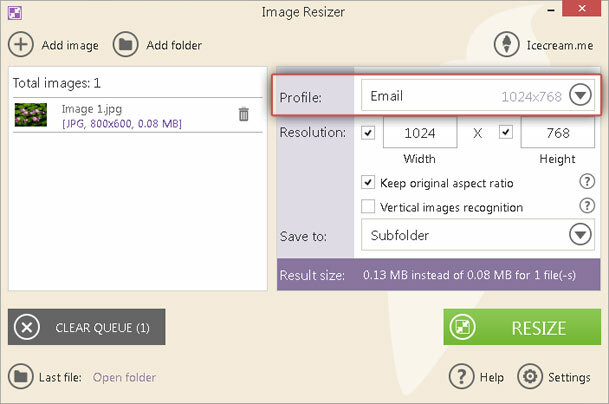 There are two buttons that represent this option: “Add image to resize” in the middle of the main window and the “Add image” button in the upper left corner. They both work similarly and open a Windows Explorer to help user choose the desired files from your hard drive. Press and hold the CTRL button to choose several files at a time and then press the “Open” button to import these images to the program. Add folder. This button is located in the upper left corner next to the “Add image” button. It allows users to import an entire folder with images. However, note that it's impossible to see the images in the selected folder while using this option, so if user doesn’t want all of them, it's possible to remove the excess files before importing the folder or use the “Add image” option as described above. Drag and drop. This option is also supported, so user can just drag and drop the files into the working area of the program. The files are displayed as a queue at the left side of the interface. Some additional data is also available, such as file name, size, thumbnail, format, and width and height parameters. There are tiny recycle bin icons to the right of each file – by clicking on them, one can delete corresponding files from the queue. Large gray “Clear queue” button in the bottom left corner allows user to delete all the files from the queue. Profile parameters are available at the top right corner of the program. Click on a gray arrow button in the “Profile parameters” box and select the desired one from the dropdown menu. It's possible to choose presets like “Email”, “Desktop”, “320x200”, “HD 1080p”, or “HD 720p”. Besides, one can select the “Manual” option if the necessary values are not presented in the list. Resolution. After choosing a preset in the “Profile parameters” section, user will see default values in the “Width” and “Height” boxes. However, they would remain blank if you choose the “Manual” option. Now, it's possible to type in any desired values. To resize only one of the parameters (only width or only height), uncheck one that you want to leave in its original value. Finally, check the “Keep original aspect ratio” box to keep the original aspect ratio and “Vertical image recognition” box to resize a vertical picture. Save to. There are 3 output location options: “Same folder + prefix mini”, “Subfolder”, and “Choose folder”. Choosing the “Same folder + prefix mini” option, user will have output images saved in the original folder and marked with a prefix “mini” for easier search. The “Subfolder” option saves the file in a subfolder within the original folder. Finally, “Choose folder” option allows using Explorer to choose any folder on the computer. Double check that everything is set up exactly like you want it. After that, click on the “Resize” button in the bottom right corner of the program to resize PNG image. It will ask you whether you want to resize the images right now or cancel the resizing and go back to the settings. Press “Resize” and wait until the process is over. To stop or cancel the process, click on the corresponding icons that are located near the progress bar. When all the files are successfully processed, click on the “Open folder” button in the popup report window and check the resized images in the containing folder.